As in biology with its classification of species, linguists also have a need for classification. They used to use terms like Phylum, Stock, Family and Dialects to classify the languages of the world. The phyla were the broadest groups. These were in turn subdivided in terms of stocks, stocks in terms of families etc. But as the relationships turned out to be too complex for such a simple taxonomy, the tendency is now to respresent them in terms of tree structures. A broad, largely geographically determined, division is made in terms of PHYLA, and from there on all we find is Language Trees. We lived as a family in the Fas (Momu)-speaking village of Kilifas, Sandaun Province, Papua New Guinea. Papuan languages have traditionally been considered impossible to place within external phyla. Even within Papua New Guinea itself, languages were so diverse that a number of special phyla were laid out. The Fas-language had been placed in the Kwomtari Phylum by Loving and Bass. Laycock added PYU on the border with Irian Jaya. The survey revealed the existence of a hitherto unkown language which I have called GURIASO, following the name of a central village. I frankly have no idea of what the phylum and stock characteristics would be in this representation. In that respect I am simply following the Loving and Bass and Laycock precedent. A copy of the report was sent to the Linguistics Department of SIL Ukarumpa, the Linguistics Department of the University of Papua New Guinea and to the Australian National University (care of Stephen Wurm and Don Laycock). Don Laycock responded a year or so later expressing strong feelings that PYU was part of this taxonomy. The rough draft is now available: Kwomtari Survey A summary is contained in my paper called Malay Influence on West Sepik Kinship Terminology., read at a meeting of the Linguistic Society of Papua New Guinea. This index lists the villages belonging to each language and the population figures from the 1979 census. As you can tell from names like Tamina 1, Tamina 2 etc., the names were often thought up by patrol officers. People traditionally live in small clan hamlets. Government authorities put pressure on them to go and live in larger villages. Light from the Dark Ages of Chomsky and Halle's "Abstrct Phonology"
Kilifas is the name of the Fas speaking village on the Yenebu river. When I left in 1989 the houses were situated on the northern bank of the river. Due to a severe flood, the river changed its course and the village has now moved to the other side. The name "Kilifas" has an interesting history. The Fas language does not have and 'l' and Fas speakers do not try and twist their tongues to pronounce it. They call the village "KRIFAS". Villages in this area are government induced. Patrol officers (called "KIAPs") requested (if not required) the people who traditionally live in small clan size hamlets to have communual villages. These villages where then given names. Names were often based on the name of the rivers they were located on. Fas speakers added their own suffix -muy, which meant "people (of)". So we get Finamoi (should have been Fine-muy), meaning "people of the river Fine", also Fugumoi (really Fuky-muy ) and Savamui (possibly Saf-muy). I could imagine that Baibai speakers reinterpreted [trifas] as [k(i)lifas] hearing a [k] and an [l] in [tr]. Subsequent patrol officers hearing it pronounced this way, then officially recorded it as KILIFAS. With this "Trifas" out of the way there was room for a new "Trifas" ("Fas 3") when it was discovered. The Fas language is spoken by less than 2000 speakers in 17 main villages. The villagers tend to spend long periods in their clan hamlets. The name Fas was given to the language by linguists, possibly Loving and Bas in 1964. Before that Capell (1962) had surveyed the area and calls the "dialects"spoken in the Bewani mountains "Bembi". 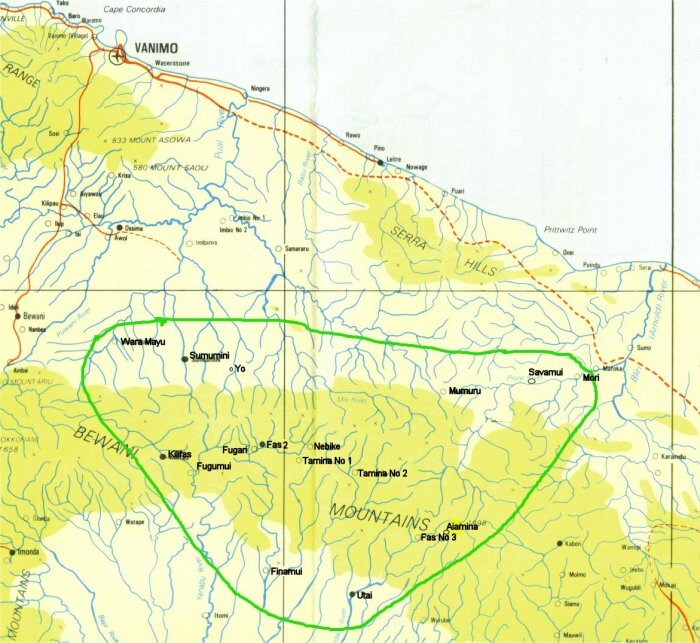 He claims that a dialect of the language is also spoken near Abau, which is way South near what is now Green River. As Fas has no prenasalised stops, it is likely that his name source was "Baibai", a closely related language which has voiced and prenasalised stops. The sample data he presents is very likely Fas (unless Baibai close resembles these forms). From these data he concludes that Fas incorporates pronoun objects in the verb. He is right but the data don't show it. Actual: fyi nE- puen - E fi nEpuenE ! Gloss water with - come - imperative "Come and bring water!" Gloss water give - imperative "Give (him/her) water !" For more on Fas grammar see the references earlier on. Fiona Blake (2007) carried out a research programme for her BA thesis in the Fas speaking village of Mori, in the North. She met with reluctance amongst the villagers to use the name of another village, i.e Fas, for their language. Upon which she decided to christen the language "Momu", the Fas word for "NO". 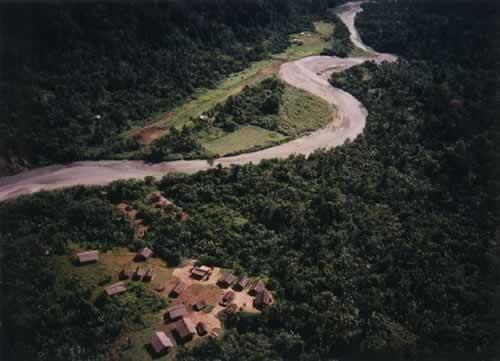 There is a tradition in the Sepik region to do so, and I am sympathetic to the idea of another name, but we may wel have to wait till the various villages can come together and decide on their own name. A change of names has the problem of breaking a linguistic classificatory tradition, as the language has been called Fas in all of the preceding literature. Also using the word for "NO" is potentially problematic in that related languages may employ the very same term. This is actually the case for Fas, where the closely related language Baibai also uses the negation "Momu".